(Re-Published from the Washington Post, Jan. 2, 2014) As the original Dec. 31 deadline set by the United States passes, Afghan President Hamid Karzai is causing a potential setback in international and U.S. relations in his refusal to sign the Bilateral Security Agreement (BSA) — the long-awaited deal to right-size U.S. force commitments after December 2014 (from 47,000 to 10, 000) and provide a legal framework for U.S. training and counterterrorism operations. Instead of the quick fix expected by all, including Karzai who had agreed to the deal, the BSA has become the latest object of the president’s political schemes as he prepares to leave office in the spring. The Loya Jirga, the grand assembly of Afghan tribal leaders, convened on Nov. 21 to review the security agreement’s details offered unanimous support and asked for the president’s signature without delay. 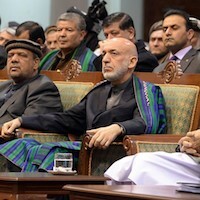 Karzai, present at the conclusion of the jirga’s four days of deliberation, refused to sign. As former Afghan President, parliament speaker, and chairman of the jirga Sibghatullah Mojaddedi said to Karzai: “You should sign it; this is our request, …and if the president does not sign it, I will promise you that, as I am a servant of this nation who has served these people for 40 to 50 years, I will resign and I will leave this country.” Mohaddedi has since left for Turkey. In his most recent comments, two main sticking points appear to be driving Karzai’s delay: (1.) his demand for a total ban on counterterrorism (CT) raids by NATO forces, particularly as these raids include entering Afghan homes at night; and (2.) greater U.S. initiative to broker a peace process with the Taliban. The second issue is complicated by Karzai’s conspiratorial belief in U.S. “secret contacts” with the Taliban and his desire for a legacy as a strong leader outside U.S./foreign influence. Our focus—using social science data collected over the last two years—is on the first issue: the seemingly outsized emphasis on the sanctity of Afghan homes. While it’s no secret that negative Afghan public opinion swirls around civilian deaths from raids—rightfully so—Karzai’s antipathy toward raids, we believe, reflects something deeper, beyond his political machinations, embedded in norms shared across Muslim communities. While there are many ways of identifying such norms and many challenges in moving beyond often individually-focused western notions of human rights, our research has examined the constitutional language of all Muslim states’ constitutions from 1947 forward. Thus far, we have examined each constitution for contributions from both Islamic law (or Shari’a) and modern international law, notably the Universal Declaration of Human Rights (UDHR), whose articles are prevalent among many constitutions. A closer examination of the constitutional language of the 57 Muslim states that belong to the Organization of Islamic Cooperation (OIC) shows that Karzai’s sensitivity to raids on homes—with an emphasis on the home’s inviolability—is a view widely shared by Muslim states. Corri Zoli is INSCT Assistant Research Professor. Emily Schneider (LAW ’13) is a research assistant at the New America Foundation in the National Security Program.